I remember thinking around Christmas time that, even though it seemed a long way away, the new racing season would soon be upon us and sure enough here Craig and I were driving to our first road race and my first race of the year. The season has started even earlier for some of the team, including Craig, in a time trial the previous day. The Clayton Spring classic has become a major event over recent seasons and this years event was the 50th edition. The list of past winners reads like a who’s who of British road cycling. Last years winner, Pete Williams, was racing in the early season Belgian classics so wouldn’t be defending his title. There were plenty of professional riders taking part though ready to add their name to the roll of honour. I had been a bit concerned about the potential weather conditions for the race in the days leading up to the event. 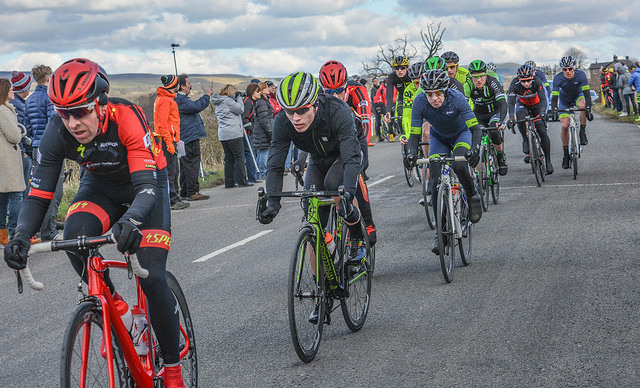 I recall the foul conditions prevalent at last years race, driving sleet and freezing conditions, which saw many riders failing to last the distance. However, this year we were blessed with a bright, dry and crisp day with temperatures up to a whopping 3 degrees! Craig and I wrapped up accordingly, no flesh on show for us boys! A few hardy souls braved the elements in shorts and lived to tell the tale, thanks to the sun making a welcome appearance and temperatures soaring by another 2 or 3 degrees after the race started! The race was to be run over 15 laps of a 4 mile, rolling circuit. It was a handicap race so juniors would set off first, 2/3/4 cats 4 minutes later with the elite and 1st cat riders setting off 3 minutes behind the 2nd cat group, which Craig and I were in. We had discussed race tactics briefly while discussing kit choice (kit choice obviously being the main topic!) and my plan was to take it easy until the elite group caught us and then try and hang on as long as I could. Craig had a similar plan. Indeed, it seemed like everyone in our group had the same plan as the early pace was quite gentle with only a few riders trying to try and drive the group along. We were soon caught, after a few laps, and the pace went up considerably. The large group that had formed when the two groups merged was whittled down by the constant stretching and snapping of the elastic, mainly due to the constant sprinting out of corners. We caught the junior group a few laps later but this did not contain a number of talented youngsters, who stayed away to the finish. They were joined by a couple of professional riders only close to the finish. Two of the juniors even managed to beat their professional rivals in the sprint to the line to take the days honours! Craig and I finished in what was left of the main group, which consisted of only around 20-30 riders. I was happy to have finished my opening event unscathed and, despite not feeling great (all racing cyclists now have a cold until October!) had been able to stay with the front group. It had also been great to be part of such a great event. Well organised, great support and crowds and even an announcer to keep the crowds informed on race developments. The promoting club’s Alan Roper, the organiser of the event for many years and a well known and liked figure on the local cycling scene, being a BC race commissaire, organiser, official and club man, had stepped down this year due to illness and I would like to wish Alan all the best and hope he is feeling better soon. I’d also like to thank Clayton Velo, all its helpers and the race officials for putting on a great season opener! This entry was posted in Results and Reports and tagged Craig Battersby, Stephen Feeney. Bookmark the permalink.